Hawaii wide receiver, above, Malcolm Lane went backward to catch a pass against JoPierre Davis during the Warriors' football practice session at Aloha Stadium yesterday. The Hawaii football team's second trip to Aloha Stadium produced a glass half-empty/half-full effect. On the half-full side, there were the four turnovers the Warriors defense nabbed in the team periods. 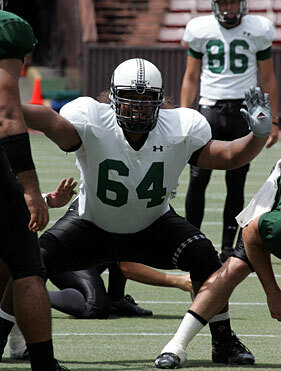 Guard Ray Hisatake, below, went through some line drills. The Warriors practiced at the stadium twice this week in an effort to get ready for the season opener one week from tomorrow at Florida. It will be Hawaii's first game against the Gators, who are ranked fifth in the Associated Press' Top 25 preseason poll. On the half-empty side, there were the four turnovers the Warriors offense gave up. "I thought there were some real big plays on defense and we scored a couple of times, but we just can't give up turnovers," UH coach Greg McMackin said as he left the field. "We gave up four a game last year, six against Georgia (in the Sugar Bowl), and you can't win when you turn the ball over." "The defense tried to set the tempo and we had a good day. ... We don't want anybody to move the ball on us." While practice at Aloha Stadium on Tuesday gave the team a chance to endure the heat, showers and overcast skies yesterday over Halawa kept the temperatures relatively cool. The element of noise was added to the mix, with crowd noise piped through the stadium's sound system. "It adds a little, but it'll be three or four times louder than what it was today," said cornerback Ryan Mouton, who returned an interception for a touchdown. "But it gave (the offense) a little taste of what it's going to be like." The defense also came up with a fumbled exchange on a running play and interceptions by cornerback Jeramy Bryant (off a tipped pass) and linebacker R.J. Kiesel-Kauhane. "The defense tried to set the tempo and we had a good day," Mouton said. "Especially being here at the stadium, we wanted to make it like a game day. We're going to play like a game day, we don't want anybody to move the ball on us." Unlike previous practices, special teams were incorporated into the periods with Tim Grasso punting the ball away four times and Dan Kelly capping the final series of the day with a 35-yard field goal. It was a rough day for the Warriors quarterbacks, as sophomore Brent Rausch went 7-for-16 with two interceptions. Greg Alexander went 10-for-19 for 91 yards with a pick. Working against the second-team defense, he led the offense to its lone touchdown of the scrimmage period, a 4-yard dart to Mike Washington. Inoke Funaki ran two series, going 3-for-5. "The defense did well, we just kind of struggled," offensive coordinator Ron Lee said. "It's good because this is game-type stuff." Lee said the offense's struggles weren't solely the quarterbacks' responsibility and saw some bright spots as the offense pieced together two scoring drives at the end of practice, but consistency in execution remains a focal point for the offense. "We need to run eight, nine, 10 plays without making mistakes, that's the key," Lee said. "We had several opportunities where we moved the ball, but we had breakdowns. We made mistakes on the routes, we broke down on the protection, it wasn't as consistent as we need to be. But we had something going and we just didn't finish. It was a combination of stuff. "We've got a lot of new people and we just have to keep getting better and be smart."